Stay as dry as possible. Moisture, especially on your feet, puts skin at risk for developing blisters or magnifying existing “hot spots”. Wear moisture wicking fabrics like synthetics or wool, and even consider using a bit of spray antiperspirant on your feet. Use Body Glide or Foot Glide before and during runs. Body Glide creates a dry, invisible, non-greasy barrier, reducing friction between your feet and shoes. Do you have new shoes? Make sure you break them in! Still having problems? This could depend on the style or size of your shoe—too small and your feet will be cramped, causing your toes to rub against your shoe and caused blisters. The opposite problem, too big of a shoe, could result in feet sliding around too much—which means added friction and potential blisters. What about your socks? Cotton socks absorb sweat, meaning more moisture, and softened skin that is easily agitated and prone to blisters. Try a synthetic or wool sock instead. As for how you wear them, some other options may include double layering socks, trying out different thicknesses of socks, or being sure to change socks whenever they get wet. Welcome calluses. Those new to running sports and other activities may find themselves getting more blisters and others. If you are a newbie, your skin is likely still much softer than a seasoned athlete. With some time, your feet will toughen up on their own through calluses (but make sure to moisturize these). However, tannic acid can also help aid in toughening feet right away as well. Try some home treatments. There are various home remedies you may want to consider for a blister. Soaking them in green tea or applying aloe vera can help with inflammation (and even overall blister relief), for example. Another option is to use apple cider vinegar or castor oil to fight bacteria. Let the blister breathe. Even if it is tempting to just throw a Band-Aid on and call it a day, make sure you let the blister breathe as often as possible. This means not leaving bandages on longer than you need to—an example could be to take them off when you are home. Let the blister heal on its own. Don’t always look at draining a blister as the first (or only) option for getting rid of one. Often, letting the blister heal on its own is what is going to work best and leave you with minimum risk of infection. If you find it would be more difficult not to let the blister heal on its own (i.e., you are having trouble walking with the formed blister), then this could be a situation where you do drain the blister. Do this the right way: clean the blister and blister area and make sure you have a sterilized needle. Base treatment on the type of blister. Depending on how your blister looks or has formed, you may want to alter your treatment strategy. If the roof is intact: Dress the blister, continue to monitor for tearing or infection, and avoid pressure or friction in the area. If the roof is torn or it is off completely (the blister is deroofed): Do the same things as above, only after applying some type of antiseptic. Watch for infection. Make sure you watch the blister for infection as it will need more treatment if it worsens. How do you know if the blister is infected? Some warning signs include pus, red streaks, worsening pain/swelling/redness, or if the blister simply does not seem to be getting better after an extended period of time. Unfortunately, blisters are all too common and form on the feet of even the most knowledgeable athletes. 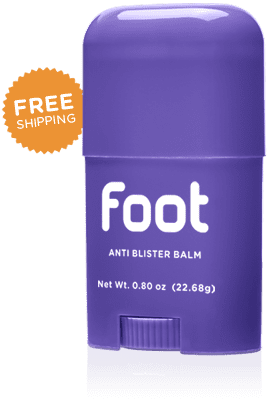 However, the right blister treatment—or even more importantly, the right prevention methods—can make all the difference in the severity of one, or in whether or not you get blisters at all. Try some of these methods if you haven’t already; your feet will be much happier! Do you have any other tips or tricks for blister prevention or blister care? Let us know in the comments!